Tooth erosion is the loss of the hard outer tooth enamel caused by acid attack. Mouth acids soften the enamel, making it more susceptible to being worn away by brushing. When the enamel is worn away, teeth can be sensitive. Tooth erosion can also result in thin, yellowish, weak areas on teeth. At Lorne Park Dental, we want to help our patients avoid tooth erosion, so their teeth can stay strong and be sensitivity-free! Acidic foods and drinks can cause erosion. Acidity is measured by its ‘pH value'. Anything that has a pH value lower than 5.5 is more acidic and can harm your teeth. A lower the pH value number means more acidity and a greater possibility of causing erosion or acid wear on your teeth. Fizzy drinks, sodas, pops, tonic water, iced tea with lemon, sports and carbonated drinks can cause erosion. It is important to remember that even the ‘diet' brands are still harmful. Even flavoured fizzy waters can have an effect if drunk in large amounts, as they contain weak acids which can harm your teeth. Acidic foods and drinks such as fruit and fruit juices - particularly citrus ones including lemon and orange contain natural acids which can be harmful to your teeth, especially if you have them often. For instance, sipping on lemon water results in a prolonged exposure to the acidic lemon. Apple juice is acidic too. Strawberries and other berries may be acidic. Vinaigrette salad dressings, tea and coffee may contribute to tooth erosion. Wine is often swirled around the mouth which results in acid exposure to more tooth surfaces. 'Alcopops', ‘coolers' and ‘designer drinks' that contain acidic fruits can cause erosion too. Sour candies are a doubly harmful to the teeth because they are acidic and sugary. Dry Mouth can contribute to tooth erosion if there isn't enough saliva to wash acids and sugars away. Bulimia nervosa is a condition in which patients make themselves sick so that they lose weight. There are high levels of acid in vomit that can do damage to the tooth enamel. Gastroesophageal reflux disease (GERD) involves acids produced in the stomach coming up into the mouth which can cause tooth erosion. Sometimes women experience acid reflux during pregnancy which may cause some tooth erosion. Drinking milk is good because it helps to cancel out the acids in your mouth. Plain, still, fluoridated is water is always best for the teeth. Drink quickly, without holding the drink in your mouth or ‘swishing' or 'swirling' it around your mouth. Use a straw to help drinks go to the back of your mouth and avoid long contact with your teeth. Limit and water down juices such as apple juice for children. Chew sugar-free gum, sweetened with xylitol after meals. This will help produce more saliva to help cancel out the acids which form in your mouth after eating. Also, saliva contains calcium and phosphate, which get picked up by the teeth and aid in remineralization. Xylitol can also starve out the bad bacteria that is known to cause tooth decay. Brush your teeth last thing at night and at least one other time during the day, with fluoride toothpaste. Wait for at least half an hour after eating or drinking anything acidic before brushing your teeth. This gives your teeth time to build up their mineral content again. Should you use any other special products for tooth erosion? As well as using a fluoride toothpaste, we may suggest using a fluoride-containing mouth rinse and having a fluoride varnish applied. Specialty toothpastes such as Sensodyne Pronamel and Colgate Sensitive Pro Relief and others may be recommended to relieve tooth sensitivity and restore the tooth enamel. How is tooth erosion treated? 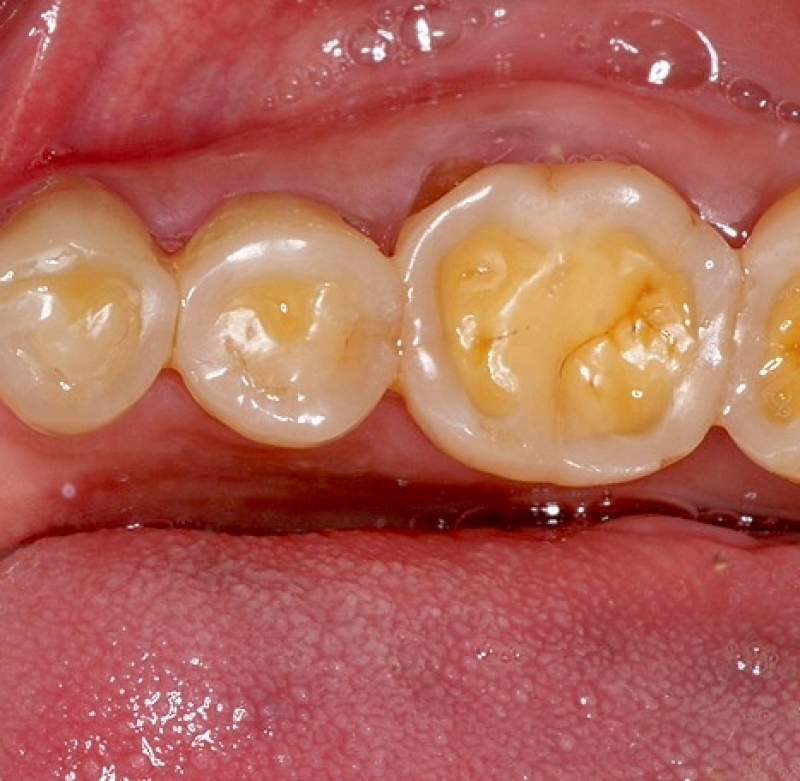 Early dental erosion does not always need to be treated. At your regular Lorne Park Dental check up we will identify any areas of early erosion and give you advice on how to prevent the erosion from going any further. If a tooth does need treatment, it is important to protect the enamel and the dentin underneath to avoid sensitivity and to reinforce the tooth. Usually, simply bonding a filling onto the tooth will be enough to repair it. However, in more severe cases a dental crown or veneer may be needed. At Lorne Park Dental we are committed to helping you prevent tooth erosion. We'll check your teeth for signs of tooth erosion at every dental visit!